As Tito’s owner dragged her dog into the lobby of the Miami-Dade Animal Services on Monday, animal advocate and shelter volunteer Christina Dickson’s heart broke into a million pieces. Tito knew! 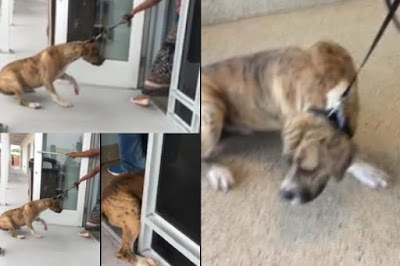 This was not the place he wanted to be, and with all his might, but still as gentle as a lamb, Tito pulled back, as if begging the woman he knew as his human companion to leave the building and return home. Without a doubt, Tito loved her. Still it was not to be. Christina spoke with Tito’s owner, who stated the dog had been a stray who the family took in and fed. Their female dog had become hostile towards Tito and refused to even let him eat. Perhaps if Tito was neutered, he would no longer be perceived as a threat to the family’s other dog? Perhaps if Tito was neutered, in the end there would be no more accidental puppies who most likely would wind up in a shelter just like their dad? Trying so hard to keep Tito with his owner, Christina even offered free veterinary services for the dog’s sterilization; his owner declined, and Tito’s death sentence would soon become a reality if no one came to the shelter to adopt him. For more information on this dog, contact the Miami-Dade Animal Services at 1-(305)-884-1101. Make sure to reference ID #A1878910.